Dr. Willock cares mightily about the comfort of his patients, and he uses all available instruments, medications, and anesthetics to keep them calm and pain-free. The major tools in his arsenal include enhanced technology, options for sedation, and approaches to dramatically reduce the time people need to sit in the dental chair. When he was a youngster, his own experiences with dentists were often unpleasant, recalls Dr. Willock. “That was a time when dentists were using the old belt-driven drills, grinding away at 5,000 rpm while they vibrated like crazy. Honestly, getting a tooth restored was quite painful. 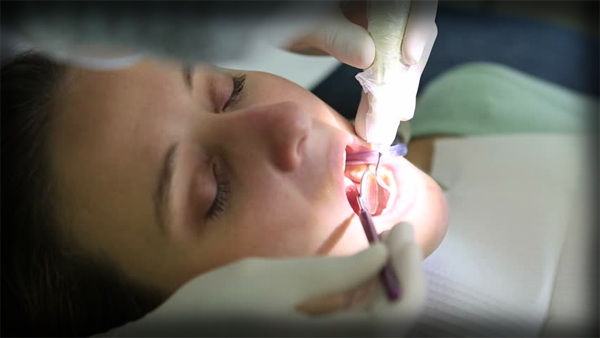 Sedation dentistry is also an option that is popular with many of Dr. Willock’s patients. For many patients, it is a different path to oral health that is far more tolerable—and, for many, even enjoyable. Another different path to dental health—absolutely pain-free—is incorporated in Dr. Willock’s practice in the extraordinary Cerac® CAD/CAM milling machine. While it is costly to purchase, the device is an enormous time saver for patients while delivering the highest level of quality that Dr. Willock demands. “There are three basic preparations of restorations this device can make,” says Dr. Willock, “an inlay, an onlay, and a crown. An inlay is a restoration that fits between the cusps of the teeth. An onlay will go over and incorporate one or more cusps. And a crown, of course, wraps up the whole tooth. The salient factor is the extent of damage to the tooth we want to restore to good health. “Once we prepare the site, we use an infrared camera to create an image we transfer to a computer monitor. Once the tooth with a hole in it is up on the screen, we outline the restoration area with a blue line, and then we push a button! The CAD/CAM goes to work, searching its library of tens of thousands of teeth, to find the ideal shape and size of the needed restoration. It will present only that part that’s missing or damaged that we are working with, and it will compare it to the available space in the damaged tooth and the teeth on either side of that tooth. We can view all of this with a rotating, three-dimensional image. “Most often, we simply slightly tweak the choice of the device, and then push another button, and the device will draw up the whole restoration in three dimensions so we can roll it around on the screen, and look at it from all sides. And then we push still another button, which sends a wireless signal to a milling machine. We start with a small block of porcelain, about the size of your little finger, and the device will actually mill that in three dimensions, and it will just drop into the prepared space.